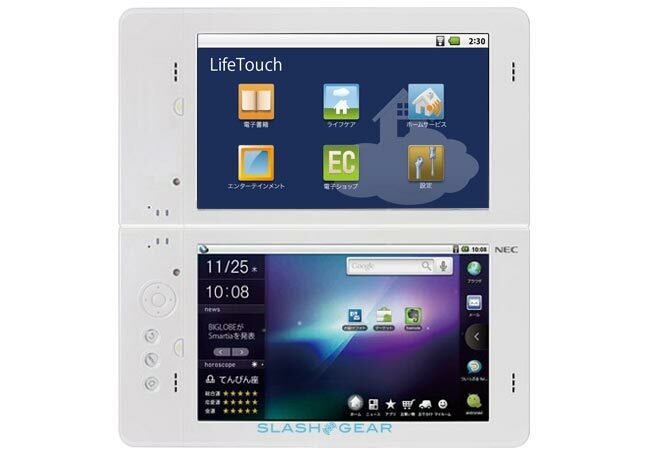 It has been revealed that NEC will hopefully be showcasing their new Lifetouch Android Tablet at CES 2011 next year. The LifeTouch slate, is expected to be equipped with a pair of 7-inch touchscreens along with WiFi, Bluetooth and 3G with the ability to show different information on each display simultaneously. The image below shows an artists impression of what the new NEC tablet might possibly look like. Details are still very sketchy at the moment on the specifications of the new NEC tablet and its not sure whether NEC will be using resistive or capacitive touch screens within the device. We will keep you posted as more information becomes available closer to CES.